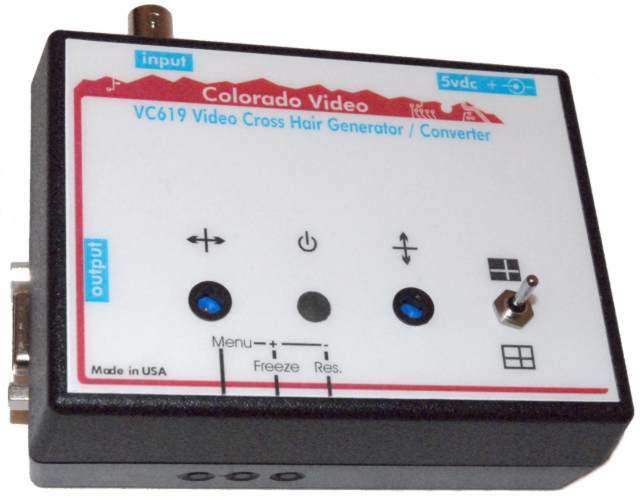 The Model VC619 Video Cross Hair Generator superimposes a crosshair or lines onto a real-time video composite video signal and then converts it to a SVGA, XGA, or SXGA computer pc-video signal suitable for connection to a computer monitor. The user can adjust the position of these lines by means of high precision multiple turn controls. With a front panel switch, the user can set the lines to White, Black, or Off. A switch to select solid or dashed lines is available as the "M" Option. Additional push button controls allow adjustment of brightness, contrast, color and hue, and selection of output signal; SVGA 800x600x60p, SVGA 800x600x75p, XGA 1024x768x60p, or SXGA 1280x1024x60p. Cross hairs or lines superimposed on video systems used for setting up automated electronic component pick and place machines allow an operator to precisely train the machine as to where components belong on a PC board. An adjustable video cross hair or line equipped video camera and monitor system can indicate where a powerful laser is going to hit before it's pulsed. A video picture with crosslines overlaid can facilitate proper alignment of a silicon wafer or other material before it's cut. Equipped with carefully mounted cameras, a video cross hair or line generator, and a video monitor in the cab, a highway line striping truck easily paints highway stripes precisely where they belong. Some blimps and other large vessels are equipped with video cameras and a cross hair or line generator to help pilots accurately guide these vehicles for mooring. Cross hair or crossline equipped video systems can help assure proper alignment for multiple pass printing processes. All prices F.O.B. Boulder, Colorado.